A while ago I was asking for Kirby art for an anniversary themed piece that I was planning to run on 8-Bit Girl. Unlike my previous features (Metroid, Resident Evil and Zelda), I wasn't swamped with artwork, comments and other things that people wanted me to feature. I am not too sure why Kirby didn't get the love that the others recieved! However...I did get one fantastic piece of art sent to me during that time. 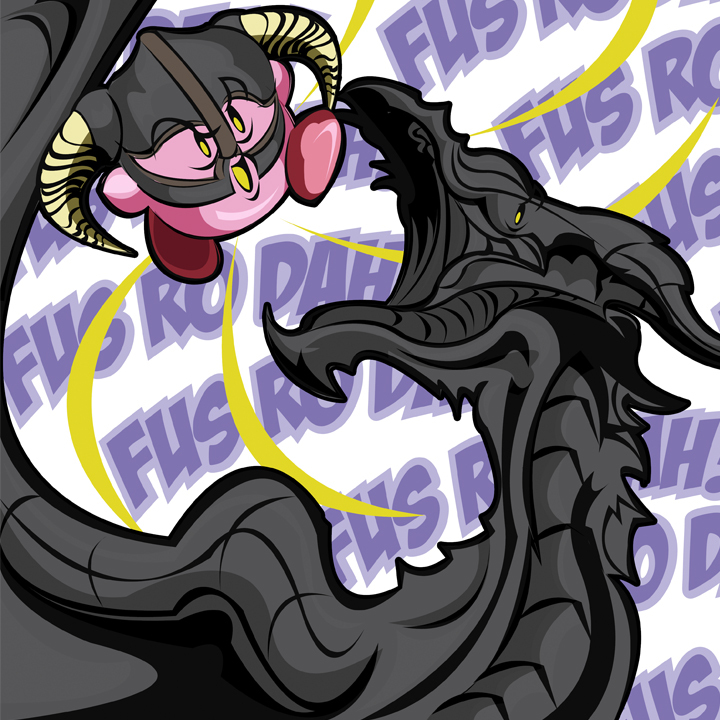 Above you can see the Kirby and Skyrim crossover piece that Michael Edstrom, a graphic designer, podcaster, gamer and 8-Bit Girl reader created. I love Skyrim, so it was brilliant to open this email and see Kirby dressed as the dragonborn doing the 'Fus Ro Dah!' shout! Is he doing the shout or is he about to inhale that dragon in true Kirby style?